And we get a fun video AND a new photoshoot! 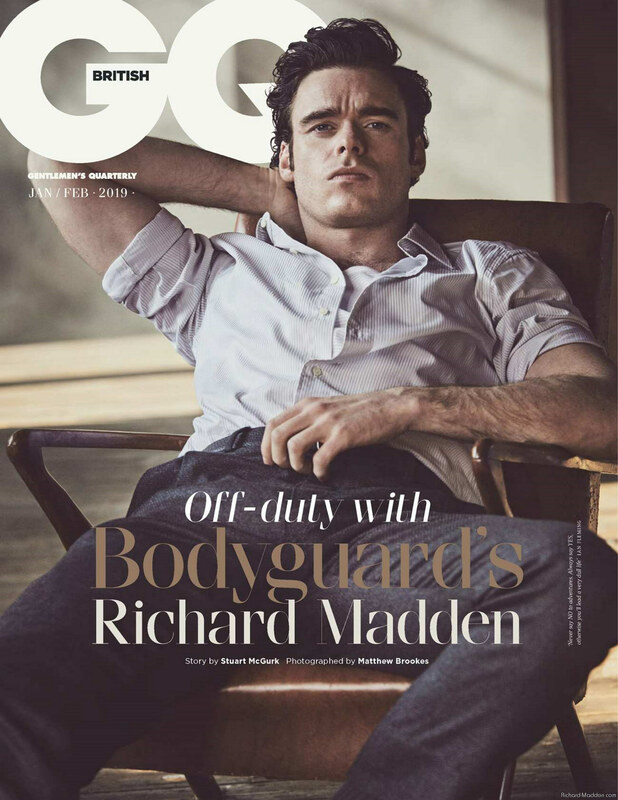 MR PORTER – It has been a dizzying week for Mr Richard Madden as the reaction to his latest television series, Bodyguard, has intensified. The BBC’s delirious new primetime thriller – which stars Mr Madden in the title role — has generally been a ratings and critical hit. However, this being 2018, it wouldn’t do to not have a furore, and Bodyguard’s so far seems to revolve around the number of women shown in positions of power. In short: there’s too many, apparently, at least, according to many Twitterati – who felt this was an example of the BBC being unrealistically politically correct. (This despite the fact that until April 2018, the United Kingdom had a female prime minister, home secretary and Metropolitan Police commissioner.) Mr Madden, who is drily Scottish at the best of times, has no truck with misogynist trolls. Handsome, affable and enjoyably cheeky, Mr Madden has thus far shuttled between two types of role: the romantic hero and the action ingénue. Sometimes he has done both at the same time – most famously playing Robb Stark in Game Of Thrones. He has played Prince Kit in Cinderella, and he has been Romeo on-stage, not once but twice. He has also bounced about and wielded a gun in Bastille Day, opposite Mr Idris Elba. Bodyguard has guns, but it’s the chance to expand his range that made him jump at the role. In the six-part series he plays David Budd, a bodyguard whose time as a soldier at war has left him suffering with PTSD. When Budd is assigned to protect a hostile, hawkish home secretary (Ms Keeley Hawes), we soon realise he may not actually want to protect her. Apart from those times when he’s in bed with her, of course.